Arthur F. Kinney has a B.A. from Syracuse University, an M.S. from Columbia University and a PhD from the University of Michigan. His research interests include Renaissance prose, poetry, and drama and twentieth-century American literature with specialties in William Faulkner, Flannery O'Connor, and Dorothy Parker. 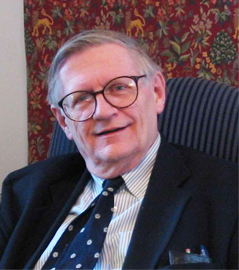 He has published widely in both areas including books on Humanist Poetics; John Skelton,Priest as Poet; and "Lies Like Truth": Shakespeare, Macbeth, and the Cultural Moment; four books on Faulkner's families and a study of Go Down, Moses; Resources of Being: Flannery O'Connor's Library; and Dorothy Parker Revisited; He has also edited a volume of Renaissance Drama and Entertainments, The Witch of Edmonton; theCambridge Companion to English Literature 1500-1600; the Oxford Handbook to Shakespeare; and Dorothy Parker's Coast of Ilyria. His current project is Shakespeare and the Mind's Eye based on Renaissance and current cognitive studies, revising Titled Elizabethans, and publishing a volume of Selected Essays.